The Arts in Horley, Surrey. Horley Photographic Club, Archway Theatre. This page lists some of the arts, cultural groups and social clubs in and around the Horley and Gatwick area. Use our contact form to let us know about your group, event or project. If you spot an errors please let us know. 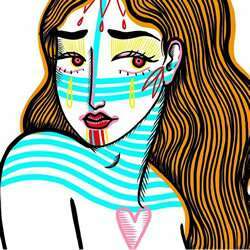 Horley based artist Eve Tilly. Eve’s paintings and artwork can be seen on her Facebook page. Eve also takes commissions for murals. Click here to visit Eve’s Facebook page. 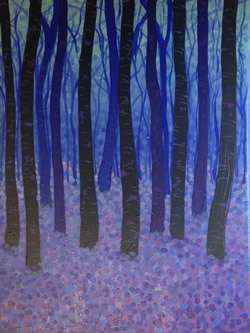 Jessica works from her studios in Horley and Brighton. Shown here is one of her pet portraits. 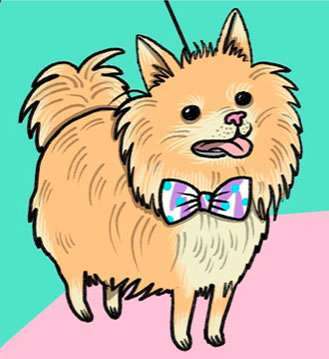 She takes commissions for family and pet portraits. Jessica also sells her work from her website. are a small friendly group meeting in Smallfield Church Hall every Tuesday from 10.00 to 12.00. There are 2 experienced tutors to help if you are new to painting and drawing so come and have a go! Just £4 when you come with refreshments included. First session free. Contact Ron on 01293 279104. Ronald Bull helps run the Smallfield Art Group, above. Here is some of Ronald’s work. Aztec Threads run Creative craft Workshops from, garment making to creative sewing projects. Plus Card Making – Canvas Crazy – Crazy Patchwork-Second Hand Beads – Felting plus many others. Website. 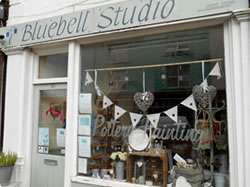 Bluebell Studio is in Station Road Horley. It is a wonderful pottery painting studio where you can indulge and explore your creativity. 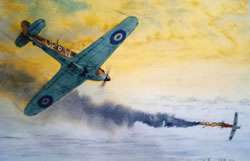 Help is on hand if needed and for those who choose not to paint, they also take commissions which make beautiful, personalised gifts. For those who fancy trying something different, they offer clay and mosaics. Visit the Bluebell Studio website now to find out more. We are a group of ladies of all ages, who enjoy: Chatting, Crafting, Reading, Baking, Theatre Trips, Outings and having fun. If this sounds like you, or if you just want some “ME” time, then come along to our meetings. We meet every 2nd Wednesday of each month (apart from August) at: Horley Methodist Church Hall, Victoria Road, Horley,Surrey, RH6 7AS at 7.30pm. Visit the Horley Evening W I web page. Horley & District U3A (University of the 3rd Age) meets on the 2nd Thursday of the month. Visit their website for full info. Silver Ribbons Dance School is based at Regent House, Albert Road, Horley, Surrey RH6 7JA. Visit the Silver Ribbons Dance School website. Swing Thing – Swing Dance, Charleston, Lindy-Hop, Jive. A friendly club in Salfords, near Horley. Visit the Swing-Thing Club website. Whiteside’s School of Dance is based at Centenary Hall in Smallfield. Get in touch if you would like your child to join. Boys and girls accepted into junior street on Fridays. Visit the Whiteside School of Dance website. Zapphire School of Dance, Horley, Earlswood and Redhill. Website. Horley Singers. The Horley Singers were founded in 1998. They rehearse on Mondays, mostly in term time, from 8 pm to 10 pm, in the Methodist Church hall, Victoria Road, Horley, RH6 7AS. Each year thet give some wonderful concerts and raise money for local charities. Visit the Horley Singers website. The Hive Rooms rehearsal rooms for musicians and bands here in Horley. 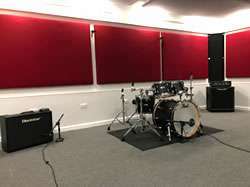 Three rehearsal rooms, an edit suite and a recording studio, professional and amateur musicians are welcome to come along and make some noise. Horley Ukulele Club meets on Thursday evenings Cafe Fifty Four in the centre of Horley (just near the railway underpass). Bring a uke along and join us or just come along anyway as we prepare for The Great British Uke Off coming to town shortly. No musical ability whatsoever required, we can teach you a couple of chords. We are soon to again face the might of the Guildford Ukejammers and the Woking Ukeaholics. What we lack in talent we make up in enthusiasm. See you at the bar from 8pm! Visit the Horley Ukulele Club Facebook page. Are you interested in photography? Why not come along to the Horley Photographic Club and see what we have to offer. We are a small, friendly club and we welcome photographers of all abilities. As well as competitions our programme includes a range of lectures, illustrated talks and demonstrations by visiting speakers and some of our more experienced members. We have at least two studio evenings where members have the opportunity to learn about lighting and camera settings for photographing models and still life subjects. We meet from September to May on Wednesday evenings at Strawson Hall, Albert Road, Horley from 7.45pm to 10pm. If you would like more information please visit our website www.horleyphotographicclub.co.uk. 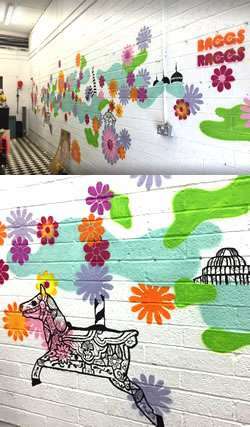 Jessica has just completed this mural for a new shop in Brighton. She works from studios in Horley and Brighton. If a mural like this would bring your premises to life you can call her on 01342 842400. Local artist Kirstin Wood creates beautiful landscape paintings and contemporary pet portraits from her studio in South Merstham, Surrey. 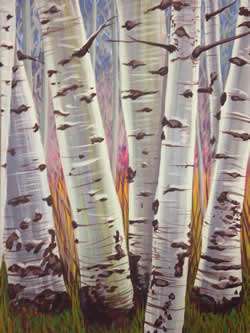 Please contact her at kirstinpainter@aol.com to discuss a commission or to buy cards, prints or paintings. Visit Kirstin's website. The Horley Branch of the WEA (Workers` Educational Association) runs short part-time courses in the Horley area on a variety of subjects.